Depending on which part of the world you’re from, you might be wondering if Hogmanay has anything to do with BBQ -specifically, pork if you’re like me and from the south (the USA, that is!). Although many people are happy when the hog delicacy shows up there, the answer is no, it’s MUCH more festive than that here! Hogmanay (pronounced HOG-MAH-NAY) is actually NEW YEAR’S EVE -and the following days- in Scotland! 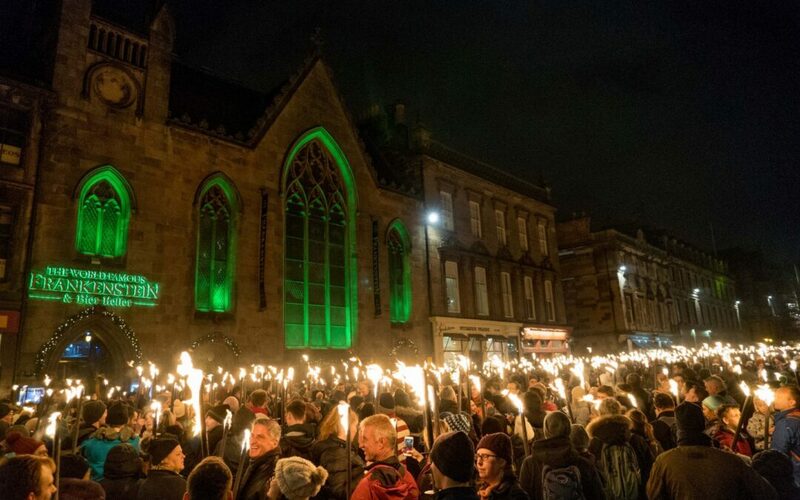 What is the history of Hogmanay? I decided to check out local sources for the latest and most up-to-date information on this holiday that is unique to this part of the U.K. Seems that this longtime tradition was thought to have been introduced by the Vikings who invaded these parts in the early 8th or 9th centuries. For as much as the Vikings were dreaded and destructive, I find that their traditions live long in the area where I am visiting. 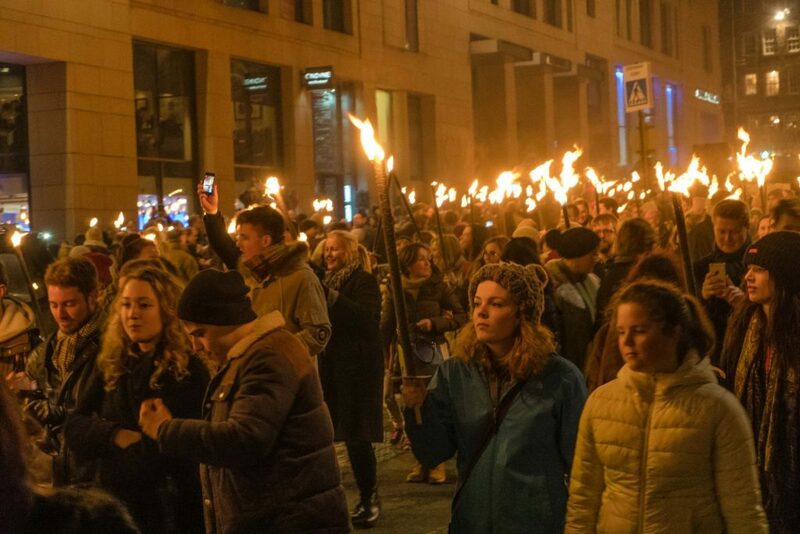 Many theories contribute to the history and reason Hogmanay is celebrated with passion and fervor in Scotland unlike anywhere else in the world. 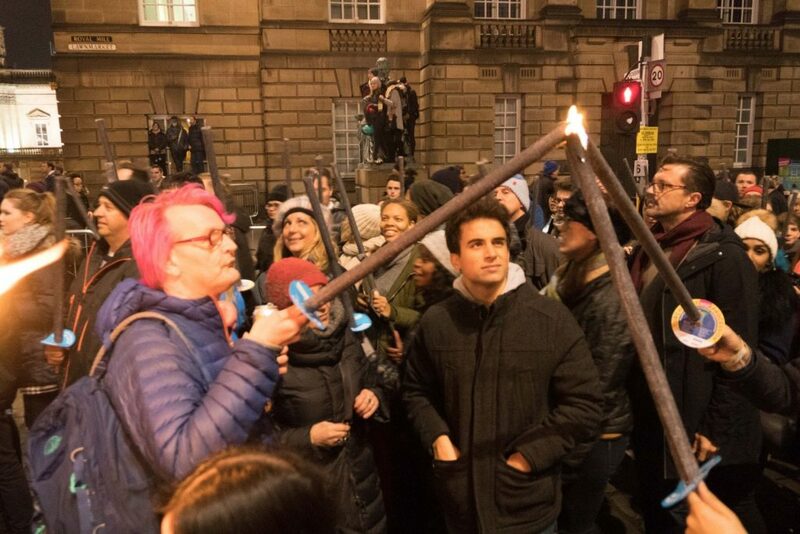 The idea of dispelling the darkness of the long winter days and bringing in the new year with LOTS of light was not lost on the city of Edinburgh, the capital of Scotland, which has a tradition called “The Procession of Torches” . 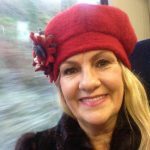 How I discovered Hogmanay last year…. Last year, while on a trip planned by my son-in-law, Boyd, my daughter, Christi and I decided to make a last minute stop before catching our train back to Glasgow. 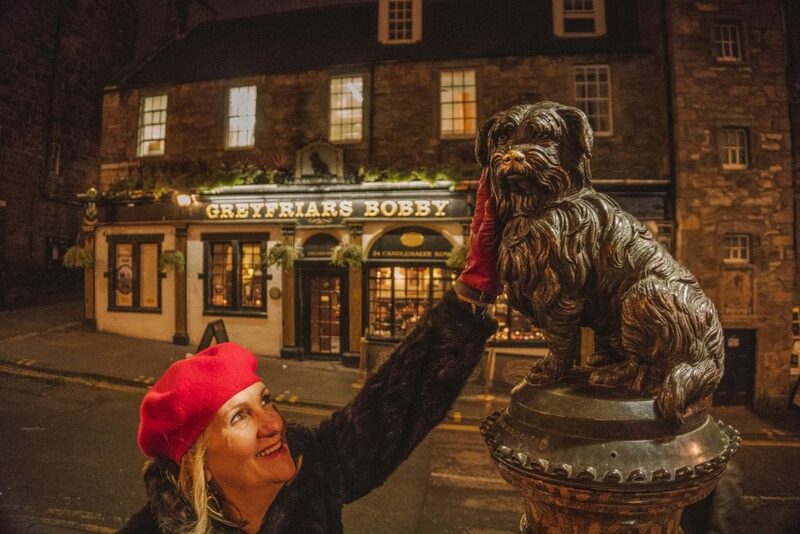 We wanted to find Greyfriars Bobby, and take a picture with the famous scruffy Skye terrier, Bobby, a bronze statue in front of Nicholson’s Pub,. Although not superstitious, we wanted to rub the dog’s nose for “Good Luck” before heading back to the West Coast. Little did we know that in our quest to find the famous pooch we would get to be part of the largest New Year’s celebrations in the world! As we turned the corner to Candlemaker’s Row, the sight of 40,000+ torchbearers come toward us. They continued marching around the city which made for a New Year’s Eve Eve (December 30th) that we will ALWAYS remember! How long does Hogmanay last? Typically celebrations begin on the eve of New Year’s Eve and continue until January 2nd. Wherever you’re celebrating the beginning of 2018, let me by the first to wish you “Happy Hogmanay when it comes”, the proper greeting before the actual holiday.